Dr. Patel joined the Cardio Metabolic Institute in February 2014 after practicing with the New Brunswick Cardiology Group, PA for over 8 years. He is board certified in Internal Medicine, Cardiology, Interventional Cardiology, Nuclear Cardiology, Echocardiography, Endovascular Intervention, Vascular Medicine, and Peripheral Vascular Ultrasound. A high performer from the beginning, Dr. Patel graduated 2nd in his class of 505 in the engineering school from Rutgers University with a B.S. in Electrical Engineering. After this he went on to receive his Masters in Electrical and Computer Engineering and worked in the field for two years before deciding to embark on a career in the medical field. In 1997 he obtained his Doctor of Medicine degree from the University of Medicine and Dentistry at New Jersey Medical School (UMDNJ) where he was ranked in the top ten percentile of his class and earned multiple scholarships, including Alpha Omega Alpha (AOA). 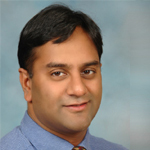 Dr. Patel completed his internship and residency programs 1997-2001 at UMDNJ-Robert Wood Johnson University Hospital where he was Chief Resident in his final year, won the Human and Professionalism Award and served as a member on the Residency Council Board. From 2001-2005 he pursued two fellowships at the University of Pittsburgh in Cardiology/Cardiovascular Disease and Interventional Cardiology and Peripheral Vascular Interventions where he was selected as Chief Fellow for both programs. Dr. Patel has been a key member of the Transcutaneous Aortic Valve Replacement (TAVR) program at Robert Wood Johnson University hospital since 2012. He also served as a Medical Executive Staff member at Saint Peter’s University Hospital from 2010-2011. Along with these appointments, Dr. Patel has was awarded with a NJ Top Doctor designation from New Jersey Monthly Magazine in both 2011 and 2012. He also has contributed to over 20 publications during his career.